Google Analytics can enhance the process of creating user personas and analyzing audiences. In this blog post, I’m going to show you how Seer created user personas for a credit counseling client using dimensions in the Audience section of Google Analytics. Has a subfolder, or keyword(s) in a group of URL’s, that can be identified with an audience. Has sufficient data in Google Analytics to analyze those subfolders or URL’s. Why did I highlight those words in the definitions? We used Affinity Categories and In-Market Segments to describe the lifestyle interests of our personas, and their preferences for certain products or services, respectively. How valid is this data? It should be stated that there are limitations to its accuracy (as there are in many methods of creating personas!). Much of the information in the Interests and Demographics sections comes from Google’s understanding of users based on their Ad Settings. This data is only available for a subset of overall users due to privacy reasons. However, as the article from Nathan Beddome states, this data is informative because it nonetheless represents a large sample of users and their search habits. Now we’re ready to walk through the process. 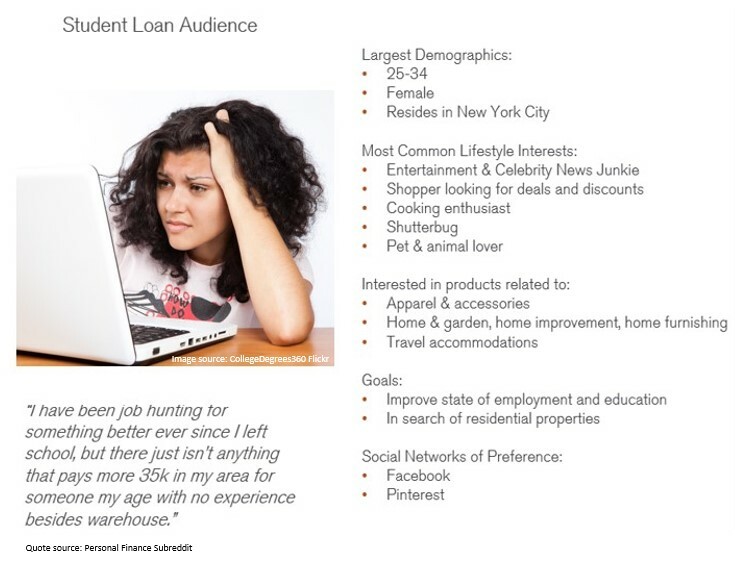 We are going to use our credit counseling clients’ Student Loans audience, and their “affinities,” as an example. Let’s get started! Set the Date Range to at least 6 months to a year. Set the first dimension to “Affinity Categories” and the second to “Landing Page.” Show as many rows as you can, without sampling. 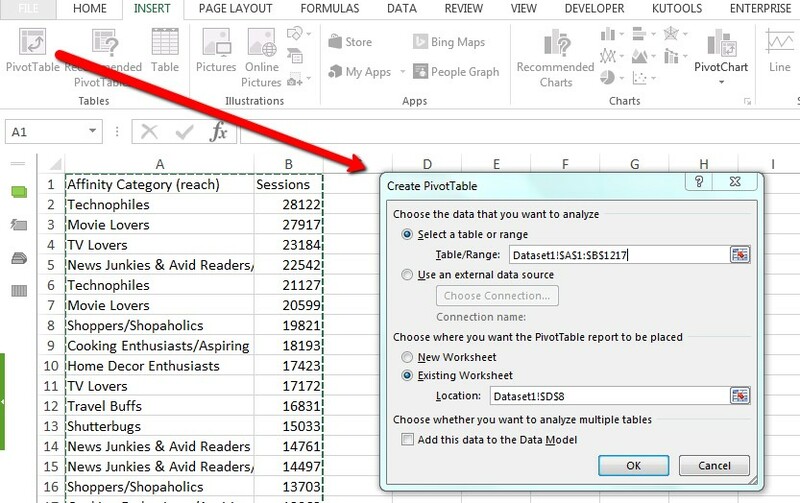 …And now, click that “OK” button, and you’ve got your pivot table! Sort the “Sum of Sessions” column from largest to smallest. Effectively, this shows you the most common “affinities” of users who visited pages related to students and student loans. You can replicate this process for the other dimensions mentioned previously, and end up with a lot of useful information to fill out your personas. We translated this data into personas with different interests, characteristics, and backgrounds, all of which provided great direction for keyword research and content recommendations. Check out the final form of the student loan example! I used Sessions as the metric for this example, but this process can go beyond that. Do you want to create more content that aligns with the buying habits of users who convert on your site? Or how about appealing to the lifestyle interests of social media users that get referred to your site? Shape this process to show what you want to show about your audience! There are certainly a lot of different ways to create user personas. I hope this exploration of Google Analytics’ capabilities will help your process. Have you used Google Analytics to help create user personas? What are some other data-driven methods you’ve used to analyze your audience? I would love to hear about them!